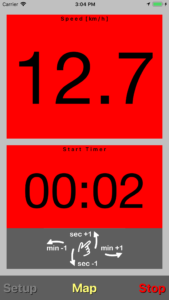 The new version of Sail Speed will be available soon and will have a sail race timer. Also an improvement is the enlargement of the button sizes. The new function is a handy start timer of 5 minutes. Timer can be selected from the setup menu. 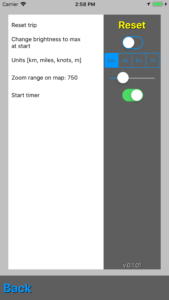 When switched on in setup menu and returned with the back button to the main screen, the start button will automatically start the start timer of 5 minutes. When timer is running it can be easily adjusted with swipe gestures. Swipe up or down on the screen for adjusting the secondes. Swipe left or right on the screen for adjusting the minutes. The whole screen can be used for this swiping. At 4 minutes the screen will flash yellow and wh ite to indicate the 4 minutes signal before the sail race start. This is a good moment to adjust your timer with swipe gestures. At 1 minute the screen will flash orange and white to indicate the 1 minute signal before the sail race start. At 0 minutes the screen will flash red and white to indicate the actual race start.